Muscular System Description | Your Guide to Healthy Living! The Muscular System plays an important part in literally everything you do, from walking to eating, even sleeping. You need strong muscles and healthy joints to keep your spine in alignment and avoid back problems. Like most body organs, muscles require exercise and nutrition to keep them strong and healthy. Read my blog post on You Need More Calories for Bodybuilding. The Muscular System description below helps you to understand how the system works. This should help you to make more informed muscle health supplements choices. Your diet alone could easily fall short in the supplying your muscles the nutrients they need to function optimally. The human Muscular System is a complex network of muscles throughout your body that controls important body functions such as skeletal movement, breathing, heartbeat and digestion. 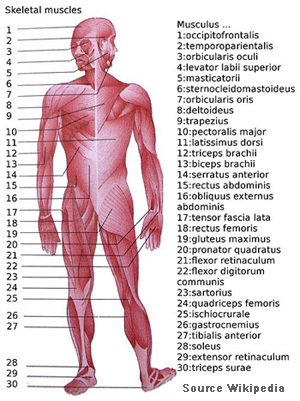 The role, main functions and main organs of the body’s Muscular Systems are outlined below. The Muscular System is an organ system that enables and controls all movement in the body. Either the muscles move the body organs and/or substances throughout the body. In some case muscle movement is automatic (heart beating), on the other hand our thoughts can also control muscle movement (playing tennis). Causes Skeletal Movement: Movement is accomplished by the skeletal muscles applying force to the bones. Muscles work in pairs and as one muscle contracts, the opposing muscle relaxes, resulting in movement. Maintains Body Posture: Skeletal muscles continuously help us to maintain body posture (siting, standing, etc.). These muscles generate the forces to lift and balance. The skeletal muscles also support and proper alignment of your spine. Stabilizes Joints: A major factor in controlling joint stability is the tone of the muscles around the joints. By limiting the movement of a joint, the muscles play an important role in stabilizing the joints. Generates Body Heat: The Muscular System makes us warm by the energy produced in muscle contraction (thermogenesis). When you are cold your body shivers to generate heat to maintaining normal body temperature. Other Functions of the Muscular System: The system has several other important functions to drive food through the Digestive System; pump blood through the Cardiovascular System; and facial expressions, chewing, breathing, etc. The Muscular System consists of muscles with each muscle a discrete organ. Muscles is made up of muscle tissue, vascular tissue (blood), connective tissue (tendons and ligaments), and nerve tissue. The Muscular System is closely connected with both the Nervous and Skeletal Systems. Cardiac Muscles that pumps blood throughout the body and located in the walls of the heart (involuntary muscles). Smooth Muscles fibers found within the walls of organs such stomach, bladder intestines and uterus. 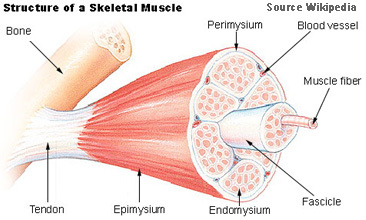 Skeletal muscles are attached by tendons to the bones. The integrated Muscular and Skeletal Systems is known as the Musculoskeletal System that moves the limbs and other parts of the body. The recommended supplements that work for the human Muscular System supplements the nutrients needed for strong muscles.The best supplements for the body Muscular System are based on user reviews and will be continually updated. Please submit your recommendations on supplements for Muscle Health by completing the form below.